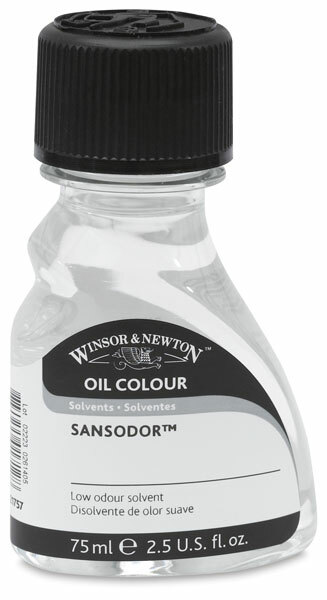 Winsor & Newton Sansodor makes a viscous mixture that evaporates slowly and is the least hazardous solvent for artists to use. It costs approximately the same as turpentine, but has minimal odor and does not deteriorate when stored. Sansodor is well-suited for artists who prefer to avoid exposure to turpentine. Sansodor — Sansodor makes a viscous mixture that evaporates slowly and is the least hazardous solvent for artists to use. It costs approximately the same as turpentine, but has minimal odor and does not deteriorate when stored. Sansodor is well-suited for artists who prefer to avoid exposure to turpentine. 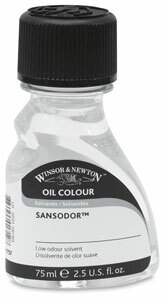 ™ Winsor & Newton is a trademark.™ Sansodor is a trademark.